The Life Of Faith: Why Motherhood Matters Review and Giveaway! I have said no to many writing opportunities lately as I haven't had a lot of extra time for writing, much less reading. But for some reason, the title of this book, Why Motherhood Matters, captured my attention, and I knew that it was something I needed to read. I knew that this book was as much for me as it was for my readers from the time I opened the first page and found my spirit identifying with September McCarthy's words. God used this book to refresh and encourage me as a mama in a season of life where I've needed it the most and I am honored to have the opportunity to share it with you all. As the author September McCarthy says throughout this book, I need to "fill my cup before it is empty". So if you're the mama who's thinking I barely have time to shower and eat, much less read, this is the book for you. I promise you won't regret the time spent in these pages. As most of you know, I am a mama to a busy 4 and 2 year old, owner of the online boutique, Amana Design, and everything else that being a wife and homemaker entails. No matter what season of motherhood we find ourselves in, it's very easy to get overwhelmed and frustrated by the responsibilities that this calling asks of us when we have so much on our plates already. Why Motherhood Matters reminded me of what a blessing my children are and what an opportunity I have to raise these little people teach them how to love. As September shares her heartbreaking stories of loss and desire to be a mother, I was brought to a place of gratefulness for the lives God has blessed me with and given a renewed desire to not take them and my role as their mother for granted. Somehow, all of the extras in life seem so important, but when we take a step back and put it into perspective, loving the Lord and our family is the most important work we are doing! I identified with September's description of an overwhelmed mom, as I'm sure most mamas reading the book will. But instead of leaving us hopeless in an overwhelmed world of chaos, September offers truths to fill our hearts and minds with to overcome the negative emotions and responses that often lead to that feeling of losing it and also gives the challenge that we don't need to do it all, we just need to focus on what's important and do that well. In fact, motherhood isn't even about us and how well we are doing, it's about the work that God is doing through us in our children. One of the best distractions from what God is doing in our lives is the comparison game. Comparing ourselves to others and committing to tasks that only bring stress and resentment is not how we want to live our lives! 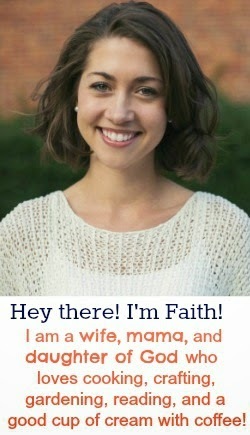 God hasn't called us to be like every other mother on Facebook and Pinterest. Instead of comparing, September encourages her readers to open our lives to one another, stop judging and criticizing and being afraid to let our less than perfect sides show. We need each other as mamas to get through this difficult season of life! Can I get an Amen? 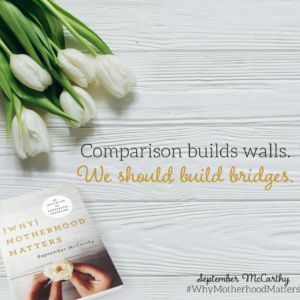 Why Motherhood Matters is a must-read for every busy mama who is looking for encouragement and uplifting in her chaos. It's a great start for giving yourself the self-care and the soul-care that is essential for every mother as you fill yourself up to be poured out into the lives of those you love. You can order your own copy of Why Motherhood Matters by clicking the following link, or enter to win a copy below!